It all began when I was nine. This book called The Scarlet Pimpernel had been hanging about the house for a while and, as the voracious bookworm I was, I naturally took interest in it. But it was the cover that got me. Those inscrutable eyes that gazed out at me and the handsome, slightly mocking smile – I decided I wanted to read it, as soon as possible. Mamma: We’ll see. Maybe when you’re around sixteen. I rather caught onto the French nobleman idea. Then of course he would have a Reason to do what he did. There was no hint of romance as far as I knew, but I decided he and the beautiful woman were at a ball together. And since the back said nothing about a love interest but did say a great deal about secret agents, the mysterious, pensive looking woman must have been a spy. Why she’d be against that guy being heroic I didn’t know, but the idea firmly attached itself to my mind. It was two or three years ago when I discovered Alexandra’sblog and got re-acquainted with that inscrutable guy I had seen on the cover. It seemed Ally liked him a great deal. Too much, I thought. One Father’s Day she wrote a post talking about how great her Dad and Sir Percy were, and, by comparison, how great my beloved Mr. Darcy was not. I nearly sent her a scathing comment, but I never actually published it, which was just as well, because I would have had to eat my words after (and they must’ve tasted horrible.) Her dad could be just as great as he liked, but I would stick with my Mr. Darcy and leave her with that Sir Percy Whatshisname if she liked him so much. 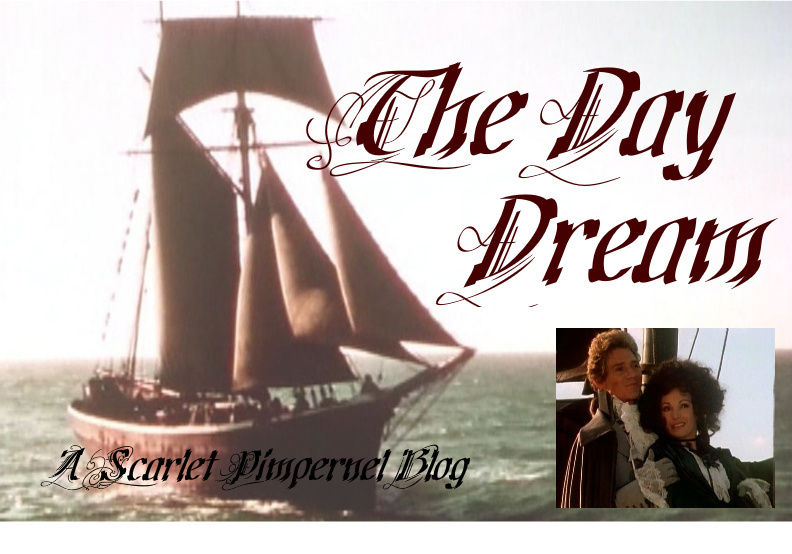 Then, a little more than a year ago, Amy reviewed a movie called The Scarlet Pimpernel, full of pictures of that same guy and how heroic he was. And I decided I’d give it a chance. Amy, after all, was a sensible girl. She liked Mr. Darcy. So exactly one year ago (it was my birthday, incidentally) I picked up The Scarlet Pimpernel to actually read it. I loved it, of course, but it wasn’t like what I imagined it would be, and it was a long time before it struck me that the idea of the beautiful woman spying on The Scarlet Pimpernel that I had made up before actually had an inkling of truth in it. So there it was. I thought it was a great book with great characters, but I was not at all crazy about it. Until I got The Elusive Pimpernel from the library. And all of the short stories. They did it. I can’t imagine how someone could not be crazy about it after reading something like How Jean-Pierre Met the Scarlet Pimpernel. I read El Dorado next. I knew it was much later in the series, but it was what the movie was partly based on, so I thought I’d see what it was like. I had it on audiobook and practically spent all day with it. I was hooked. Even the Infamous Flea-Riddled No Good Very Bad Worthless Armand seemed quite a harmless chappie to me. Until it happened. I wasn’t that worried. Sir Percy had managed to get out when a whole city was held hostage for him. He’d find a way, I knew. But the chapters flew away with incredible speed. I had the whole contents of the audiobook opened in a window on my laptop, and there were only twenty-five chapters. Now only a couple chapters left. Percy’d have to be quick. Only two chapters left. Really, how could Percy escape in two chapters? The chapter began. Marguerite was restless and lonely. Sir Andrew and Suzanne came to tell her that Percy had been captured. Marguerite decided to go to Paris at once. Only one chapter left. Then I knew what would happen. Baroness Orczy wanted to make and end of it. Just enough time for a heart-breaking last farewell and then the guillotine. I turned off the audiobook, broke down, and cried. But I went back to it soon enough. I wasn’t going to miss any bit of Percy’s last hours. I put my cursor over the window on my laptop and turned on the last chapter. Then I realized. That window showed only the first half of the book. There were forty-nine chapters in total. I turned the audiobook back off and broke down again. “He’s alive, he’s alive.” And I never again doubted that he’d stay that way. He had twenty-four more chapters to finish off Chauvelin and delight us all with a brilliant escape. I watched the 1982 movie soon after that. It was all I expected and more. I wasn’t even worried by the twist ending. For pity’s sake, I had been tortured most of the way through El Dorado. Percy wouldn’t die now. And besides, I had heard that Percy would duel in the movie and he couldn’t duel after he was executed. While listening to El Dorado I basically ate, drank, and lived TSP for a week. That kind of thing is usual for me. But it's also usual for me to stop thinking of it when I'm done. But when I was finished that, the fascination didn’t go. It didn’t go after I watched the movie either. It hasn’t even gone now. And that, m’dears, is why I’m writing this.